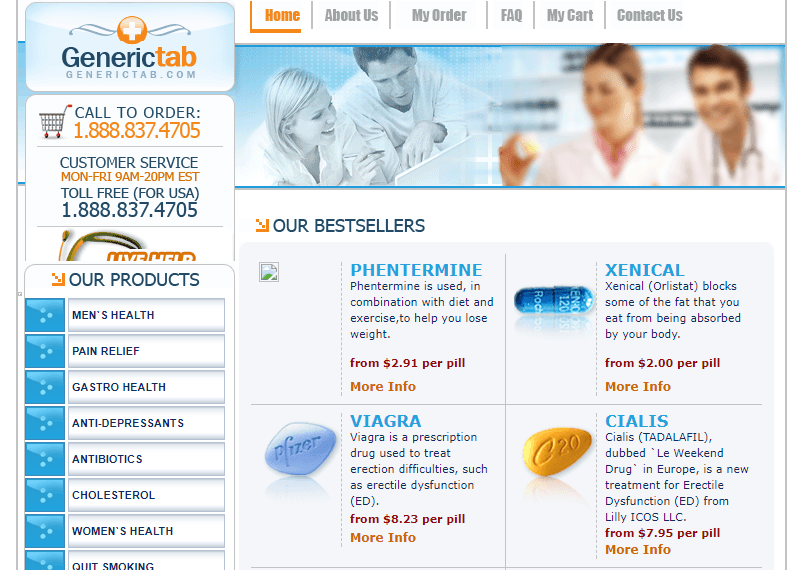 GenericTab.com used to be an online retailer that claimed to offer good quality drugs at great prices while keeping the identity of the client as anonymous. The company did so because keeping anonymity helped people disclose their embarrassing medical conditions that they were not able to share with any doctor or pharmacist. Generic Tab gained popularity for being a one stop shop for all the medications along with the services offered by a medical consultant. It was necessary for me to check each and every aspect of this company since it had been closed down. I came to know that GenericTab used to work from Baltimore, United States and dealt in both generic and branded drugs. The store used to focus on providing generic alternatives at low prices for several conditions like depression, insomnia and obesity. Shipping services were offered to the US customers but I could not know if this store served customers residing in other countries as well. Another speculation that I came to know regarding Generic Tab was that it used to send its items from India. Delivery services were provided by using EMS or the USPS and the company ensured that it will deliver the products in 7 to 10 days. The methods of payment accepted at this company included Visa credit card, JCB, the Western Union and American Express. The company ensured that it protected the personal information of its customers by taking strict measures. The company of GenericTab could be contacted by calling at 1.888.837.4705 or by sending an email. Because GenericTab had to follow state and federal laws, it did not accept any refunds. The company did mention that it used to have live chat, however, I was unable to find any tab to initiate a session. GenericTab.com had received some reviews on an independent reviewing website so, I had to check them one by one to find out more about this store. The first review had been given by a customer named Renee who said that she was ordering for the first time so was “unsure” about her experience. However, she placed an order and was contacted by the pharmacy the very next day for confirmation. She further said that “it took about a week” for the store to ship the ordered product but the company had also provided the client with a “tracking number” so it was easy. The customer said that she received the products from India at a “surprisingly fast” speed. Lyndy said that she tried to place an order and received an email about a phone number that “did not work”. Hence, the customer sent the company her phone number and details. She got so many calls from the company over and over again and the customer said that it seemed like “they were calling from their car”. She said that she immediately canceled the order and would not buy any medicines from this store. Another customer who ordered a medicine from GenericTab said that he had received his order and would post a review in a few days to tell if the product worked. The last comment was also a positive one in which the customer was impressed “with the speed of which customer service responded”. The client said that he would definitely recommend this store. The customer reviews were authentic but mixed in nature so, to get some insights about this store, I decided to check other sources. After knowing that there were no reviews regarding the store in the year 2017, I decided to check Scamadviser. LegitScript had said that GenericTab.com was a rogue website with no proof of authentication so, it was not a safe platform for buying drugs. Generic Tabs also does not have any discount sections or any discount coupons being offered to its customers which are clearly putting a damper on the high hopes of customer who were willing to buy from this pharmacy. This puts a light on the carelessness of the staff of this website who were focusing on ways to scam people, without even thinking about making some attractive offers to the interested buyers. GenericTab.com was unable to become a part of my list of recommended pharmacies mainly because there was no proof of its credibility. While I was searching for this pharmacy on the internet, I came across some reviews that had been given by the customers. Some of them were really good and depicted the store as a credible and responsible source of buying drugs, but at the same time, I also came across me few negative reviews. Scamadviser said that the owner of this website used to hide his real location hence, the store had not been recommended to be used. I would give Generic Tab a rating of 1 out of 5. Such stores are a threat to customer’s safety and must be prevented at all costs. 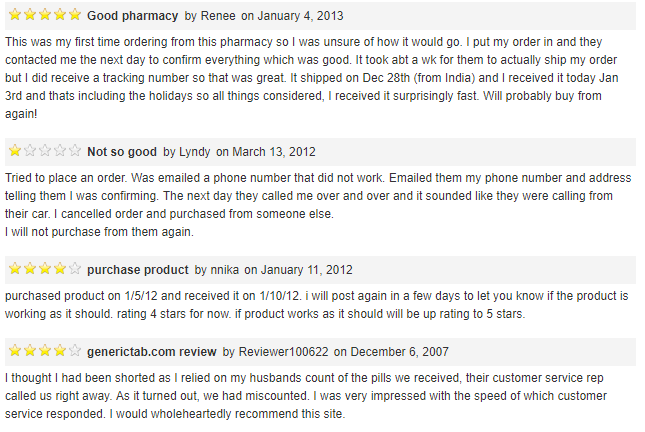 Prev Ezbuyrx.com Review – US Virtual Pharmacy not Serving the US Customers!